New Zealand -- The family grow up. Despite the lack of solid research material such as we had for the voyage out to New Zealand and the first year or two we can piece together some of the story about the latter part of the 19th Century and the Philp family. After the Philp family had been established in Shortland, or Thames as it became, for seven years the final chapter of the Alexander Bowie property development story was written. In 1874, the Trustees under David and Helen's marriage contract advertised the property that they had taken into their control in 1862 when David's shawl manufacturing business, in which he had been a partner, was in financial difficulties. Eligible Property in Dumbarton Road For Sale by Private Bargain. The workshops, cellars, stables and ground situated in Dumbarton Road, Stirling presently occupied by Messrs Thomas Macnab, joiner, William Wilson, bootmaker, W Duncanson, druggist and other tennant, will be sold by Private Bargain. The site for development is one of the best in Stirling the frontage being 49 feet and the length from front to back 104 feet 6 inches. Offers to be lodged with James L Philp, Solicitor, Stirling on or before Monday the 16th February current. That the property did not immediately sell can be judged from a re- advertisement in the Stirling Observer dated March 6th 1874 when the same property is now offered for sale by Public Roup to be held in the Golden Lion Hotel at 2.00 oclock on the 20th of March. The upset price is given as �600. That sasine entry states; Disp by Mar. Con. Trustees of David Philp, sometime Teller in the branch of the Bank of scotland, Perth now residing at Shortland, New Zealand and Helen Bowie of Philp to Daniel Mc Ewan, Iron merchant, Stirling of 1 rood 14 falls and 3 ells of ground in the Enclosure called Allan Park near the Burgh's Gate of Stirling bounded on the north by the new Dumbarton Road turnpike excepting feu rights. Dated May 18th and 21st 1874 thereon behalf of said grantee. My mother was Alexander Bowies last surviving offspring and inherited about �10,000. 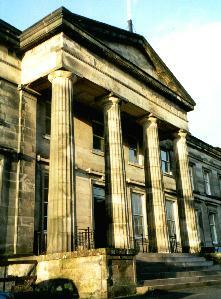 The solicitor to her marriage trust was J.L.Philp of Stirling. The same firm were Solicitors to the Forrester Estate so that from 1866 to 1916 ( The date of writing) the one law firm has handled legal business for my family. J.L.Philp was no relation, at least no close relation of ours. Present name of the firm is Philp and Dobie and their address is 3 Port Street, Stirling. The sum of �10,000 seems excessive for the property prices of the time but as James was only 14 at the time of settlement he would not know all the details. This is the last will and testament of David Philp of the Thames in the Provincial District of Auckland, Colony of New Zealand--I bequeth my soul to God trusting in the merits of my Saviour who has redeemed me by his most precious blood--I leave my body to be buried in the nearest greveyard--trusting to a glorious resurrection. I give and bequeth everything I may posess to my dear wife and with favour to dispose of my watch and -------personal effects as my said Dear Wife may think proper, to my son Andrew Bell Philp and my daughters Margaret Elizabet Philp and Agnes Philp and hope and trust that they will be kind and obedient to their mother-- if they are not they cannot expect God's blessing--- Witness my hand at Thames the eleventh day of July One Thousand Eight Hundred and seventy eight. DAV Philp. The terms of this will are interesting because of what is not said rather than what is. There is absolutely no mention at all of James A. Philp, his eighteen year old son. The conclusion, in the absence of any further information, that father and son must have had some serious disagreement is the only thing to account for David drawing up his will in these terms. NB perhaps the move to school in Auckland is relevant here ---check dates. Text and pictures will be added later.